​The Minnesota Pollution Control Agency (MPCA) is withdrawing the Wild Rice rule from the rulemaking process that it has been in for nearly a year. Recent findings by an Administrative Law Judge and the ongoing expressions of concern from all sides led the agency to reevaluate their plans, according to Stine. The agency engaged Minnesota Native American tribes, elected officials, businesses and municipal wastewater systems that may be impacted by the rule, and also received thousands of comments from environmental advocacy groups, other stakeholders and the public. However, the MPCA concluded it was time to withdraw the proposed rule to allow for more work on the implementation process. Wild rice is an important part of the ecosystem in many Minnesota lakes and streams. Wild rice has strong cultural significance and use to many Minnesotans, and is an important economic resource to those who harvest and market it. In 1973, Minnesota adopted a sulfate standard to protect wild rice based on studies showing that wild rice was found primarily in low sulfate waters. The MPCA and many other organizations and individuals have been working on revising and updating this standard for several years. In 2011, the Minnesota Legislature directed the MPCA to conduct research on the effects of sulfate and other substances on the growth of wild rice. This research was intended to inform an evaluation of the existing wild rice sulfate standard. rule to an Administrative Law Judge with the Minnesota Office of Administrative Hearings. Recently, Congress took another swipe at our retirement security when the House attempted – but failed – to pass a budget gimmick that would result in cuts to Social Security. That’s not the first effort, and it sure won’t be the last. For as long as Social Security, Medicare, and Medicaid have existed, there have been those who have fought against them. This is an important moment to remind Congress that our retirement security is critical. Too many Americans are struggling to get there, even after a lifetime of work. Help us send a message to Congress to oppose cuts to our earned benefits, and instead protect, strengthen, and expand these critical programs. The Steelworkers Organization of Active Retirees (SOAR) and Rapid Response have teamed up for this action to protect our retirement security. After you add your name by clicking on the yellow box above, we’ll transfer it to a postcard. The postcards will be delivered to Senators and Representatives by both active and retired USW members in Washington, D.C., in May! The Company is taking a hard line stance on paying you your S&A benefits. You are required to ensure your doctor fills out his portion of the S&A paperwork and faxes it into USS Disability Management within 21 days. We recommend that you never leave the hospital or clinic without the completed paperwork in your hands. It’s best if you or a family member stop by the hall with the paperwork, and we will fax it and call to make sure they have received it. We’ve had three brothers and sisters denied benefits in the last couple months, so don’t play around with these!!!!!!!!!! Based on working the full 480 hrs that will be $1656 gross. Senate moving fast on health care; please make a call this week. The Senate is pushing hard this week for a vote on their health care proposal, which they are calling the Better Care Reconciliation Act. The bill shares many similarities with the widely unpopular House bill that the President called “mean.” Millions will lose coverage. The wealthiest get tax breaks. We will pay for it because the excise tax remains. Read on for some key numbers. 13 - Number of U.S. Senators who shaped the recently-released bill in secret. Billions - Amount of tax breaks going to the wealthiest because of this bill. 22 million - Number of people who will lose health care if this bill becomes law according to the Congressional Budget Office. 0 - Number of Senators who will lose their health care if this becomes law. 5x - Rate at which older Americans can be charged more for insurance compared to younger Americans (five times as much). 2 out of 3 - Portion of seniors in nursing homes who are served by Medicaid. The Senate bill contains massive cuts to Medicaid. More than 1/3 - Number of children covered by Medicaid that this bill puts at risk. 10 - Categories of “essential health benefits” that could no longer be included in health care plans if a state decides to opt out (benefits include hospitalization, emergency care, pregnancy and newborn care, mental health and substance abuse treatment and more). Please join the fight to oppose this bad bill that delivers for the wealthiest, while harming everyone else. Call your Senators at 877-607-0785. The number will use your zip code to connect you. Make sure to tell them who you are, where you’re from and to oppose the health care bill. Call back a second time to be routed to your other Senator. Note: There’s potential for high call volume this week, so some calls may not be connected. *Net worth compiled from 2014 public filing data from the Center for Responsive Politics. **The excise tax – sometimes called the “Cadillac Tax” – is a 40 percent tax on insurers above a certain dollar limit on health insurance plans. We expect that this tax will be passed on to us. The company has told me that they are looking at all your swipe in and out times. For most of us it's 8 minutes in and 4 minutes out. The Pit is 2 minutes out and a few places are 5 minutes out. ​They are going to start docking your pay and giving you discipline. Don't give them a reason! McKinsey: How does it always get away with it? After the election, we said when it comes to issues that impact Steelworkers we will push back when needed, but work with President Trump to do what's best for working families. The President's investigation into the importance of steel to our national security will help save USW jobs and sends a message that a healthy and vital steel industry is the backbone of our country, critical infrastructure and military. If you agree, click the link to send a message to the White House: usw.to/trump232. At the 2017 Constitutional Convention our union committed to exploring the creation of Veterans of Steel, a place in the United Steelworkers (USW) where those who served or who are serving our country can find resources, camaraderie, support and a way to fight for core issues such as a fully-funded Veterans Administration (VA) or protecting and creating family-supporting jobs after service. ​Prominent U.S. Steel bear Gordon Johnson is out with a new note explaining why he sees further trouble ahead for the U.S. steel company. Here is a link to the USW International convention website, Lots of good stuff here! Take a look at the bloomberg article below, make sure to click the link to get the full story. A couple of U.S. Steel Corp. executives had to hit a low bar to get a bonus last year. How low? Their divisions could have lost millions of dollars and they’d still get a fat payout. Looks like we will receive profit sharing of $0.49/hr for the 3rd quarter. which will be $235.20 if you worked the full 480 hrs that were eligible during the quarter. NAFTA – a defining trade deal between the U.S., Mexico and Canada – took effect in 1994. After more than two decades of refusing to comply with its commitments, the Mexican government’s failures to adequately protect workers’ rights continues to have a direct impact on workers here and there. While the USW will continue our strong partnership with our union allies in Mexico to improve the lives of workers on both sides of the border, we’ll also keep fighting for every job, like the 1,400 being lost in Indiana. County Commissioner Keith Nelson has asked that we pass this update on to you due to the amount of questions his office has received regarding the road leading up to our plant entrance. Roadway lighting will be operational soon! Parts are on order to make the lights compatible with the power available on site. Stripes and lane painting will be done this spring. PITTSBURGH, Feb. 1, 2016 /PRNewswire-USNewswire/ -- Members of the United Steelworkers (USW) union have ratified a new three-year contract with U.S. Steel that will cover 18,000 workers at more than a dozen facilities across the United States. 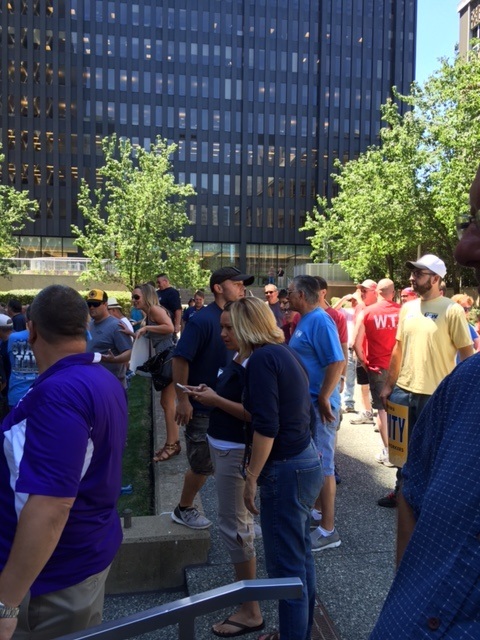 USW members voted by a greater than 2-to-1 margin to approve the contract, which will take effect immediately. The two sides reached a tentative agreement in December after six months of often difficult negotiations during an extremely challenging environment for steelmakers across the country. U.S. Steel's opening proposal contained demands for major cuts in pay and benefits, along with changes to work rules and other concessions that could have cost workers and their families thousands of dollars per year. After agreeing to a contract extension, the two sides continued to exchange proposals well past the previous contract's Sept. 1 expiration date. While the new agreement includes modest changes to active and retiree health care coverage, the union was able to fight off the company's demands for significant premium contributions, as well as other large-scale out-of-pocket increases. The contract keeps wages at their current level, but includes an increase in the USW's profit-sharing percentage, which will allow workers to receive payments when the company bounces back from the current crisis. The agreement also resets supplemental unemployment benefits for laid-off workers. "The past year has been a difficult one for the steel industry, for USW members, and for manufacturing towns all across this country," said USW International President Leo W. Gerard. "The key to weathering this crisis is not to attack each other, but to work together to find solutions to our common problems - namely the severe imbalance and unfairness in our trade system. This must be our shared goal as we move forward." Over the past year, illegally low-priced imports from China and elsewhere, along with global overcapacity and a decline in oil and gas drilling brought on by lower fuel prices, drove prices and demand for steel down and led U.S. Steel and other companies to idle plants and lay off workers at factories around the country. "I am extremely proud of the solidarity and the commitment to fairness that the Steelworkers showed throughout this process," said USW International Vice President Tom Conway, who led the union's bargaining committee. "These hard-working men and women were determined not to be made scapegoats for what is a global crisis." Mike Millsap, who serves as USW District 7 director and secretary of the bargaining committee, said the union looked forward to working with U.S. Steel to address the industry's trade imbalance and to position the company and its work force for future success. "We are proud of the productive relationship we've built with U.S. Steel," Millsap said. "We hope to build on it as we move forward from what has been a very challenging year." The USW is the largest industrial union in North America, representing workers in a range of industries including metals, mining, rubber, paper and forestry, oil refining, health care, security, hotels, and municipal governments. PITTSBURGH (December 19) – The United Steelworkers (USW) union’s bargaining committee reached a tentative agreement today on a new contract covering 18,000 workers at more than a dozen facilities across the United States. The contract is subject to ratification from the members of 26 local unions at those facilities. That process is likely to take several weeks to complete. Details of the agreement will be announced following ratification. “This has been a difficult year and a difficult round of bargaining, but I am proud of the way the brothers and sisters of the USW stood up and demanded fair treatment,” said USW International President Leo W. Gerard. Bargaining between the company and the union began in June, in the midst of a crisis for American steelmakers. Illegally low-priced imports from China and elsewhere, along with a decline in oil and gas drilling brought on by low fuel prices, resulted in overcapacity across the globe. That drove prices and demand for steel down and led U.S. Steel and other companies to idle plants and lay off workers at factories around the country. U.S. Steel’s opening proposal contained demands for major cuts in pay and benefits, along with changes to work rules and other concessions that could have cost workers and their families thousands of dollars per year. After agreeing to an extension, the two sides continued to exchange proposals well past the previous contract’s Sept. 1 expiration date. “Our members were determined throughout this process not to be made scapegoats for the problems of unfair trade a global overcapacity,” said USW International Vice President Tom Conway, who chairs the bargaining committee. Mike Millsap, who serves as USW District 7 director and secretary of the bargaining committee, said the union would continue to work with employers and politicians to address the problem of unfair trade. “As we move on from a difficult round of bargaining, we look forward to building on this collaborative relationship with the company to address the problems that have led to this crisis,” Millsap said. Tom Conway's response to the USS letter regarding retiree benefits. As you know we are working under an agreement extension and as a result have not finalized the bargaining regarding the upcoming open enrollment for retiree health care. Given the deadline for open enrollment we have told USS to proceed as if there were no changes in plan design or premium, but as you’ll recall the HMO options were no longer being offered by the HMOs and in some communities that will be an issue as our retired members will need to select the traditional plan. Additionally our over the cap funding mechanism will be exhausted, if no agreement is reached, in the middle of 2016. Should we get to that point and we don’t have additional funding to supplement the company’s obligated payments, we will see increased premiums as described in their attached letter. This letter will undoubtedly cause some concern among our retirees both pre and post Medicare eligible. I’m certain it will generate questions to you. You should advise our retired members that we are continuing to bargain and we are confident we can head this issue off before the worst happens but given the open enrollment timing requirements we understand the need for some communication to take place with the retirees. Stay in touch and if anything develops with USS I’ll be in touch and we can regroup here in Pittsburgh. At this stage there hasn’t been significant changes and there’s no sense in us using up scarce resources when the company maintains its unacceptable positions on certain of the issues that remain open. Stay strong. text USS to 47486. As always we will keep this website updated as fast as the information is released to us. I'd like to thank you all for your ongoing patience and support! A regular contract update will be issued later today, I will post it here as soon as I have a copy of it, we will also distribute in the plant as early as possible. Sad news this morning, ATI, a steel company based in PA, will be locking its employees out of their jobs beginning this Saturday, August 15th. These are our Steelworker sisters and brothers being put on the street because the company they work for would like to use the current, temporary market conditions to take back 40 years of hard fought benefits. Our brothers and sisters at ATI are effectively under siege, their own employer attempting to starve them out by denying them the opportunity to show up to work and earn the living they need to feed their families. They are denied the opportunity to come to work and produce the steel that ultimately becomes the profits for their employer, If ATI can afford to make no money at all during this lockout, then they must have enough money to negotiate a fair contract with its workers. ATI/USW contract talks started approximately one month prior to the start of our own contract negotiations with U.S. Steel. I hope that when this attempt to bully and intimidate our sisters and brothers into stepping back into the darker days of labor negotiations ultimately fails, the rest of these"has been"
Fortune 500 companies will take note and understand that we will not be taken advantage of, we will not beg for crumbs, we will not give back the work and sacrifice of generations before us and will not sell out our future and that of our sons and daughters to pad your profit margins to make you look good to wall street. We will be here to cut that lock when they come to their senses, we will be here to run your plants and make the profits you so desperately covet. We will be here, one day longer than you. 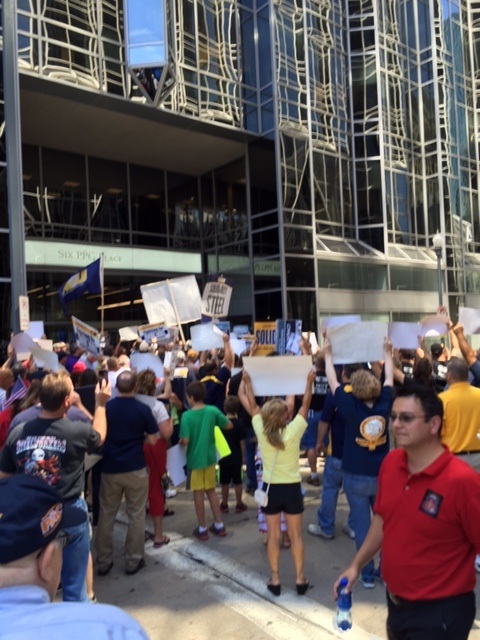 Steelworkers rallying against ATI for a fair contract ! U S Steel 2nd Quarter reports show there will be no profit sharing for this quarter. This has been the third week in Pittsburgh for Arbo, Jack and myself. We have finished Local Issues to the point that a few issues will be sent to the Top Table for further review. Right now there are three main committees we are working on: Arbo is on Contract language, Jack and I are on Healthcare/Benefits, and I am on the Safety Committee. As more proposals get put on the table from each committee there will be sub-committees put together to deal with each issue as needed. 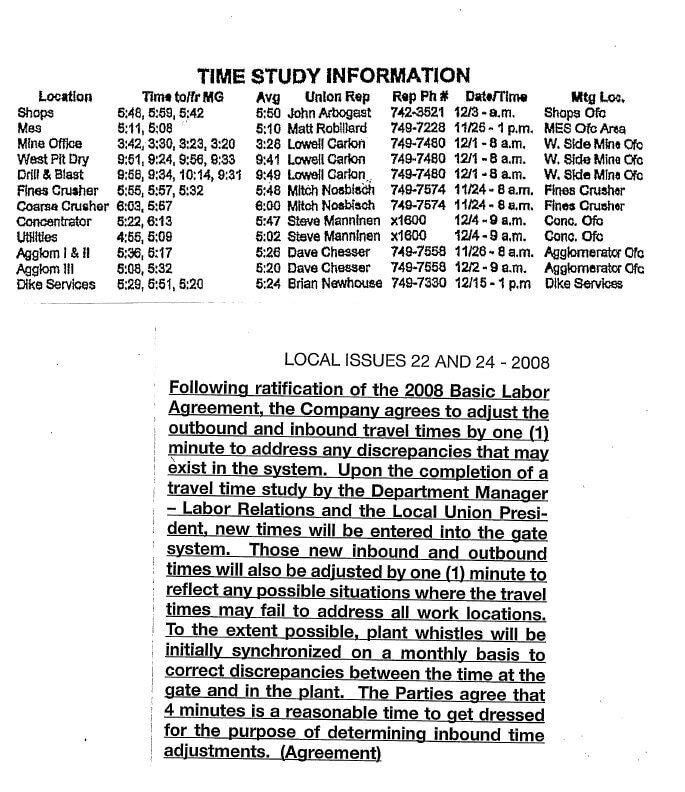 As of today the Company has recalled all Plant MTM’s and Ironworkers for a total of 68 returning. All maintenance will be returning to a 40 hour week starting the week of July 26. The majority of the projects, including the Line 5 Agglomerator rebuild, the Concentrator and Fines Crusher maintenance projects, can be finished prior to full startup. We have been fielding a few calls about maintenance working a 40 hour week while operations is still on a 32 hour week and members still on layoff. I would like to remind our members that until maintenance projects are complete, like the line 5 rebuild, we will not be running at capacity. That’s the way it has always been and probably always will be. Over the next two weeks all employees on layoff should be recalled. Finally, I would like to thank our sisters and brothers for your support and patience going through this rough stretch. We can make it through just about anything if we work together as a Union. 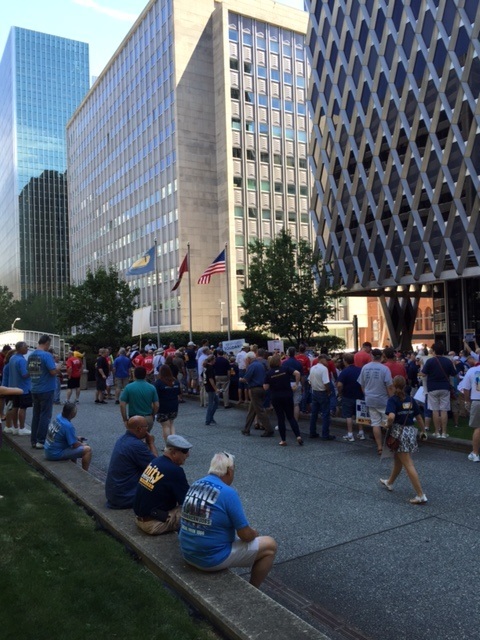 About 100 USW leaders, representing thousands of workers from U. S. Steel facilities around the United States, kicked off contract talks during a series of meetings in Pittsburgh on June 16 and 17. The members first met privately to map out the union's plan for bargaining a new master agreement, then gathered for a presentation from U. S. Steel representatives outlining the state of the industry and the company. While USW and U. S. Steel leaders agreed that industry conditions - particularly the effects of unfair trade - will make this round of bargaining difficult, both sides also expressed an interest in working together to combat those issues and reach a fair agreement. While we recognize that the current climate is difficult, we refuse to allow the company to use that as an excuse to attack the union. We are committed to having an honest and open dialogue and working together toward creative solutions. We have faced bad times in the past and made it through them together. We will do the same this time, without turning our backs on the workers and retirees who have helped to build this union and this company. USW leaders are now on their way back to their home locals to begin bargaining over issues specific to each site, including problems involving labor relations both with retirees and active workers, scheduling, contracting out, and training, among others. On July 6, the committee will return to Pittsburgh to begin bargaining a new master agreement to replace our current three-year contract that expires on Sept. 1. These talks will include issues of wages, benefits, safety, health care and pensions. Thanks to years of hard work by our union brothers and sisters, U. S. Steel jobs are among the best in the industry. They are jobs that support families and make for thriving communities. With the strength, solidarity and wisdom of our members behind us, we are determined to make sure this doesn't change. By standing together, working hard and staying strong, we know we can succeed. On Friday, May 29th we were informed that the Department of Labor issued a Certification of Eligibility granting us (TAA) Trade Adjustment Assistance. We will be providing details on the granted benefits once they become available to us. Before you go on a VLO you will required to use up your full week vacations, you can keep single that remain left over. Employees who are not laid off must be given 60 days notice before you can be forced to use your vacation. Please refer to pg. 149 of the contract book for the the full details on the layoff minimization plan.